The saw arrived the other day in perfect condition and I must say it is beautiful! More to the point, though, is the fact that it cuts wonderfully. Thanks for all the care you put into creating it. It is truly an heirloom piece that will be a mainstay of my shop—a treasure really—for the rest of my life. I started hand joinery when I built my workbench a few years ago. 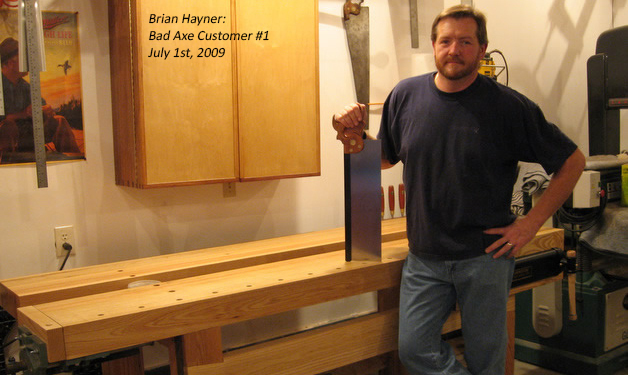 However, like many woodworkers, I had no idea what a good Western handsaw could do. Then, Bad Axe appeared online. After reading some of the reviews and learning a bit about sharpening theory, I decided to bite the bullet and order the 18" Large Tenon Saw filed 10pt rip. What a revelation! My other saw was also a 10pt, but there the similarity ended. 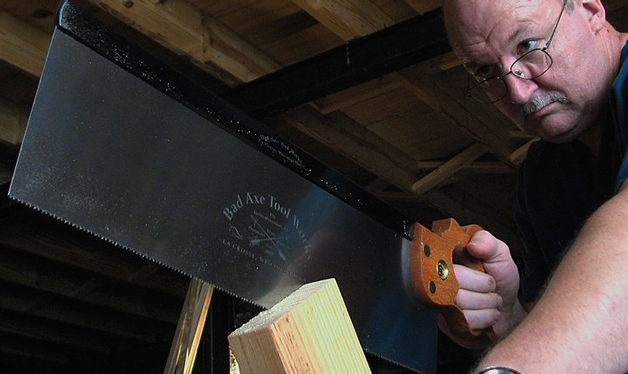 The Bad Axe Beast would blast through a tenon cut with less than half the strokes of the other saw, and at the same time left a smoother finish. I don't regret a single penny spent on it. Here's a big saw for big work, with the balance and grace to handle medium-range requirements as well. It's a beastly-sized saw, so unimaginatively, we call it The Beast. 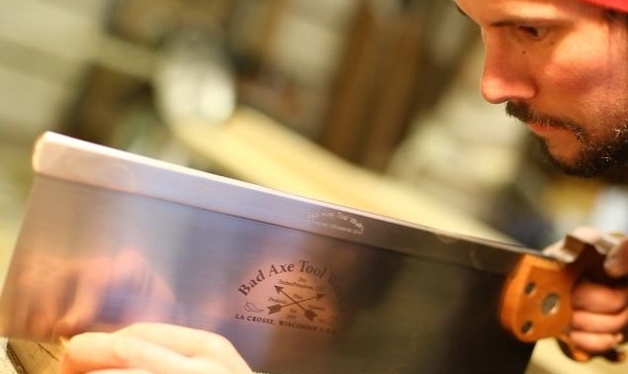 This saw features a 4.5" deep x 18" long premium-grade Swedish spring steel sawplate, a firearms-grade, black-oxided carbon steel back, standard hickory, with optional cherry or walnut handles, and standard brass slotted fasteners with optional black-oxided or niter-blued carbon steel slotted fasteners. Standard filing suitable for most purposes are 10 ppi rip, 11 ppi hybrid, and 11 ppi x-cut. 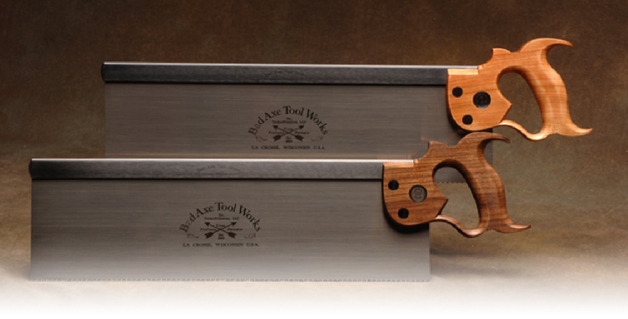 Frankly--my personal favorite filing for this saw is 11 ppi hybrid. 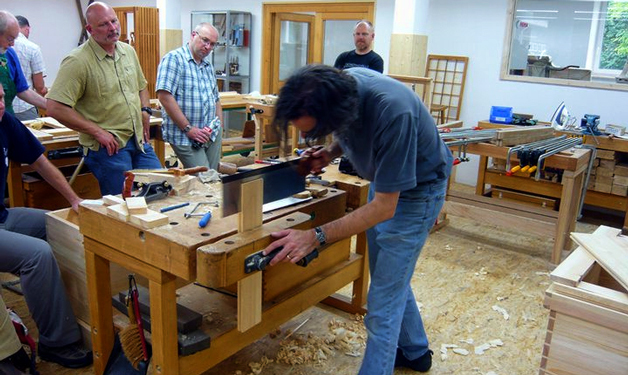 Whenever I build a new workbench, I can both rip tenon cheeks and slice off the shoulders in this mode. 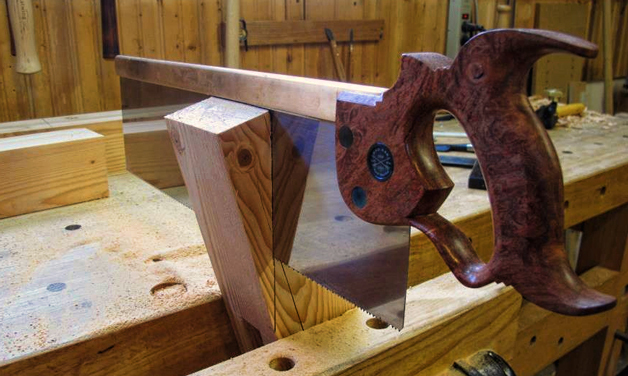 Hybrid-filing also lets you use your tenon saw as a hand-held miter saw--a great alternative to the constraints of miter boxes with elevator posts which constraint up to a third of a 30" saw's utility alone. But hybrid-filing is my personal preference as a woodworker. We each possess our own unique style when woodworking, and choose to size, trick out and use our tools in th way that works best for us as individuals--but do consider hybrid-filing--it works out better for the pocketbook, the difference in ripping speed is negligible, and you'll get just as clean a cross-cut on the end grain as you would with a (slower) saw filed dedicated crosscut. Be sure to check out my bench hooks to accessorize this great tool if you'd like it filed in crosscut mode. Why do I want this saw? The Beast is a big saw for big jobs. While its thin 0.025-thick plate excels at crosscutting, and will still rip quite nicely, I have decided to offer an optional, thicker plate for dedicated ripping purposes in beefy stock. Why? Because if you are a timber framer, or one who frequently rips deep cheeks in wide stock, you'll want a thicker plate. Any sawplate will heat up in the friction of a deep cut, the area along the toothline will expand, and without appropriate set and perhaps some lubricant like camellia oil or canning wax, the resulting heat expand and warp the metal along the toothline, promoting drift in the cut. It's simple physics--a slightly thicker plate will absorb more heat without expanding. So while thinner plates are certainly desirable for most cuts, at the end of the day this 18" bad boy requires a thicker plate for dedicated ripping into big joints. Now let's switch back to the desirability of an 18" saw with a .025" thick plate: use the thinner .025 plate for dedicated x-cuts and for the occasional rip cut. I've found that this size of saw works phenomenally with the smaller miter boxes you can pick up pretty inexpensively on eBay, where length and a thinner plate counts the most. 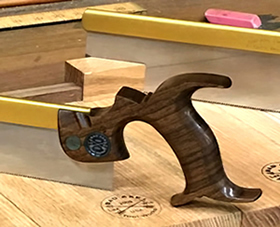 Getting back to timber-framers: if you have a large shoulder cut against the grain to make, the .025-thick plate in either the 16" or 18" saw will be a great companion for your dedicated 18" ripping saw with the .0315 plate. The key thing is to tell me about your upcoming project, the most prevelant wood species you intend to use, and typical cut dimensions you think you'll encounter. That way, I can custom-file your saw to best suit your needs, given the way I employ my saw sharpening techniques. So what are you getting for the $50 upcharge? It's obviously not cheap--because it's not a cheap plating process for us to apply. But what you get is corrosion and wear resistance, along with that deep, brass/bronze look that retains its golden lustre over time. Give it a shot--this is a drop-dead gorgeous plating that will retain its deep, rich look for the generations to come.